NEW YORK, NY, December 8, 2011 -- Phil's Foreign Auto has been selected for the 2011 Best of South Portland Award in the Automobile Repair category by the U.S. Commerce Association (USCA). Phil's Foreign Auto is on Facebook! Our AIM widget is now working again. The State of Maine is trying to implement sales tax (use tax) on labor items. This would raise the cost of your repair bills, potentially significantly, as it would effectively raise our labor rate by $4.70/hour! This $4.70/hour would go straight to the state! Its not fair that the state has frozen wages and then gives themselves a 5% raise!! A citizens initiative has placed a moratorium on this bill that was supposed to be effective January 1st, but its important that you go out and vote on June 8th to defeat this bill once and for all! !!!!!!!!! !VOTE ON JUNE 8TH TO STOP THIS!!!!!!!!! !!!!!!!!! !VOTE ON JUNE 8TH TO STOP THIS!!!!!!!!! Are you paying too much for car repairs? Vehicle repairs cost an average 34 percent more at new car dealerships than at independent repair shops, resulting in $11.7 billion in excess costs annually to consumers, according to a first-of-its-kind study just released by the Automotive Aftermarket Industry Association (AAIA). The study reveals dramatic differences in the costs of parts and labor between domestic and import vehicle nameplates and from city to city. Consumers in Los Angeles pay as much as 46.8 percent more at dealerships than independent repair shops for repairs. The cost to consumers of specific repairs also varies widely. For example, the average cost for radiator repair for a foreign nameplate vehicle, including parts and labor, is $325.99 higher at a dealer than at an independent shop; and the cost to purchase and install front brake pads on a foreign nameplate vehicle is $138.92 more at a dealer than at an independent shop. AAIA’s Vehicle Repair Cost Analysis: Comparing New Car Dealerships vs. Independents looks at the parts and labor costs of 10 vehicle repair jobs for domestic and foreign nameplate vehicles in six cities across the country, including Boston, Newark, Atlanta, St. Louis, Los Angeles and Seattle. “In response to repeated requests by congressional leaders studying the merits of the Motor Vehicle Owners’ Right to Repair legislation, AAIA commissioned a study to once and for all provide a comprehensive analysis that validated the contention that it costs consumers more to repair their vehicle at new car dealerships than at independent repair shops,” said Kathleen Schmatz, AAIA president and CEO. * Vehicle repairs for parts and labor averaged 34.3 percent more at new car dealers than at independent repair shops. * Foreign nameplate repairs performed at dealers averaged 36.8 percent more than at independent repair shops while repairs performed on domestic nameplates averaged 31.5 percent more at dealerships than at independent repair shops. * Total 2008 cost difference for consumers having repair work performed at car dealers rather than independent repair shops for the 10 jobs equaled 11.7 billion. The Yahoo! mail delivery problem has been resolved for our mail server. Keep in mind, if you use Yahoo! mail, you may not be receiving all the mail you are expecting, but still receive all the junk you should not. I want to thank all our loyal customers for allowing us to service their cars. It is their loyalty that keeps us in business! Thanks To James Sulinski for securing our update page. Bored internet hackers will have no fun here! If you are having a hard time getting a ride back to work or home, or need a ride here to get your car, call us! 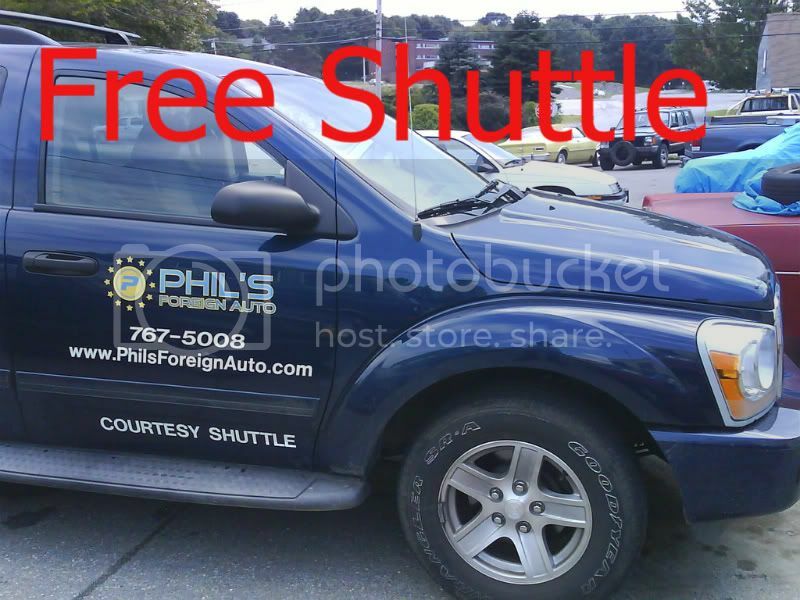 We have a shuttle service that will bring you back home or to work, and can bring you back to us to get your car! Serving South Portland, Cape Elizabeth, Portland, and other select areas. One Communications, uses XHTML which is not compatible with XML, and upon receiving this faulty information, made no attempt to notify anyone in our company of the discrepancy, even though the contract information disagreed with the directory information. One Communications now transmitted this faulty information to the 411 directory assistance people and to our local Fairpoint directory publisher Idearc Media. When Idearc Media polled the 411 data base, upon receiving the faulty information, they decided to proof read and correct the punctuation and spacing rather than contacting us to inform us of the discrepancy. When the sales representative sold us our new larger color ad, he never once mentioned the name change, even though the last 25 years we have been known as Phil's Foreign Auto. He even referenced last year's ad that showed us as Phil's Foreign Auto! He never even thought to ask why the name was changed, and he never showed us that our name was changed! So there is no one here names Apos. Apos is XML code for ' (&apos) that was incorrectly interpreted by One Communications. This error was especially perpetuated by the ineptitude IDEARC MEDIA by editing and then printing it in the Fairpoint Phone book. * Some exceptions apply, such as repairs with used parts.